We propose to discover the stand up paddle alone or in groups formed by you, your family or friends. We also organize sessions specially adapted for summer camps, works councils and bachelor(ette) party. For the stunt: bachelor burials with our stand up paddle giant ocean. Up to 8 with a board on a wave. Sensations guaranteed! We offer a friendly time, original, playful and sporty. 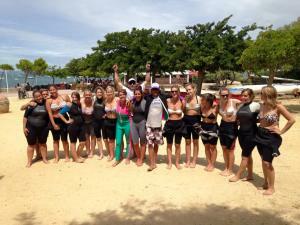 Group session suitable for all or sportier tour, you will live an unforgettable experience. During the session, we often suggest a more original situation for the futur married man and the bride. 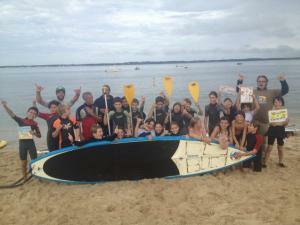 We offer Team Building’s session on the beach in Arcachon. Our goal is to work on team cohesion and to create a performance in an original envirronnent. Handling equipment, presentation of the activity and the environment. We provide all the equipment needed to practice: boards, paddles and wetsuits. Our qualified instructors teach the art to practice this original discipline affordable by any public. We focus on interpersonal communication and introduce the management team problems. Through a relay race in groups, we develop teamwork, stress management and solidarity. Each performance is unique, contact us for a quote depending or your wishes. We can guide you to one of our partners for lodging, transport and catering.